Parliamentarian Ven. 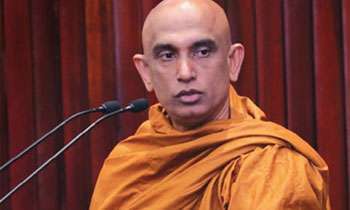 Athuraliye Rathana Thera said that he will not act as a Presidential Advisor from now on as there has been no advice sought from him so far and claimed he feels ashamed about holding the title. “I have a title before my name which reads President’s Advisor though there no advice has been sought from me so far. I only feel shame when my name is mentioned with the title President’s Advisor put in front. I have no connection to the President’s Advisor title and will no longer hold that post," said MP Rathana Thera on Saturday (28). The thera made these comments at the 30th Anniversary celebrations of the Sri Lanka Women’s Development Co-operative Society that was held at the Viharamahadevi Park in Colombo. Well said Sir. As you are a Chit MP you should also resign from the MP post. You will not do it. You sold the duty free car permit and that duty was paid us from ever bus ride and loaf of bread or bun. Sad and shame. Why should you be ashamed? They should be ashamed for not seeking your valuable advice. Maybe it is not needed yet. The great Socrates said “ True wisdom is in knowing that we know nothing” the President knows everything. The President needs advisors not to advice him but to remain as advisors to hoodwink the public into believing. I would not even trust your opinion on Buddhism... showing urself wrapped in a saffron robe does not prove wisdom, discipline, honesty, knowledge. You should also resign your MP post and go to the temple and confine urself to do your Budhist work and preaching ,That way you will do us Sri Lankans a big favour. Excuses now that elections are near, this monk is on the lookout getting into the Olympic long jump team. Your advise was not needed - what are you qualified to advise on? Getting ready to jump? Can I fill the vacancy? You can start advising on how to make money by crooked means. Only subject you are well experienced in.